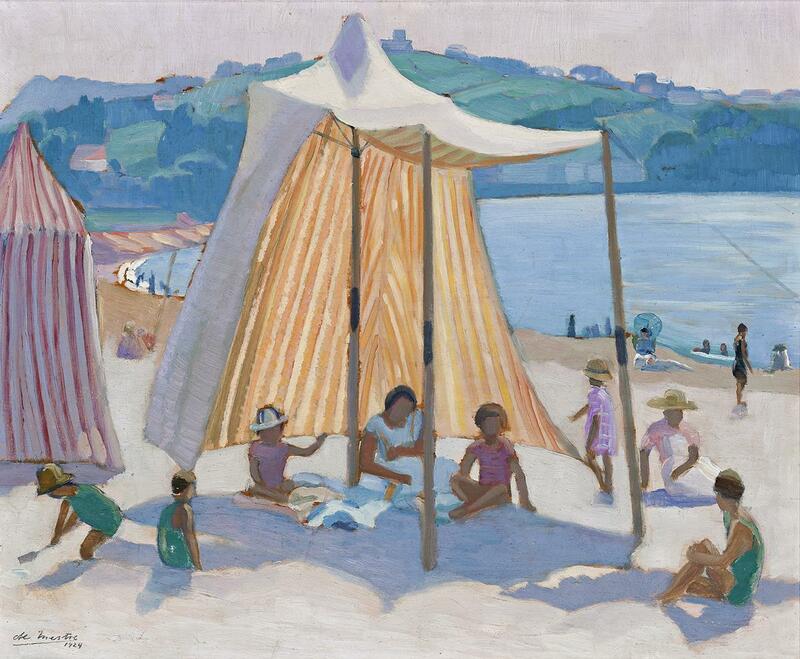 ’In On The Beach, 1924 the group lounging on the sands is sealed to a setting of flooding sunshine with rich effect, against a firmly painted background of buildings.’1 A Sydney art critic gave wholehearted approval to the painting — which, as research suggests, is probably not this but a larger painting, on canvas, in which the beach is hemmed behind by tall buildings. Yet the adjectives ’flooding sunshine’ and ’rich effect’ are much better suited to James Fairfax’s work, the central motif of which is the rich glow of sunlight through sunlit canvas, than to the grey tonality and oblique light of the larger work. Both paintings were in the exhibition Roy de Maistre held six months after returning to Sydney from two years studying abroad as the holder of a NSW Travelling Scholarship. 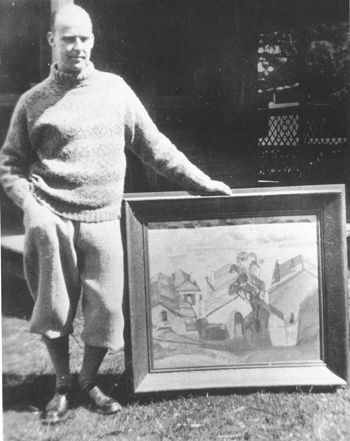 The artist had felt extremely nervous about how his paintings would be received in his home city, where his modernist style had raised the hackles of some of the art community’s powerful figures. One is immediately struck by the ’perfection’ of this painting: its elegance of construction, its exquisite detail, its finish, above all, its glowing light. The effect of effulgent light is the sum of a simplified composition, luscious brushwork and light-filled colours — white with orange, red, pinks, viridian green, blues, sand, white-beige — subtly warmed by the wood panel which the artist has deliberately left un-primed, letting it show in narrow outlines between the zones of colour. Similarly, I am told that when painting on canvas de Maistre, in the 1920s, would apply an initial layer in grey tones against which the coloured over-painting was supposed to shine the more brightly. There, perhaps lies the difference between the larger beach scene mentioned above, which is on canvas and (judging from its tonality) may have an underpainting in greys, and this, where the wood, glowing behind the paint, infuses the image with its warmth in much the same way as, in the image, the sun, shining through the canvas, irradiates the striped tent. De Maistre, whose first study had been music, conceived his art as a composite of music and painting. A performance so perfectly tuned as The Beach has about as much relation to a sketch from nature as a chattering passage of music by Ravel to the noise of a railway station, yet the connection was there in both cases. De Maistre’s studio image was strictly true to life. One may walk onto the sand by the Yacht Club at St Jean de Luz, face the south, and see the scene he painted. Everything in the painting is in its correct form and place: the direction of light, the curve of the beach, the neighbouring town of Ciboure (complete with the buildings of that time), the rounded hill and, at its side a distant molar-shaped mountain peak — the Haya (Trois-Couronnes) in the Western Pyrenees. De Maistre, as the composer of this piece of visual music, plucked from the scene its basic shapes, tuned his colours, and practised his theme over and over before attaining the state of finished art we see here. The impeccable facture appears to have been the work of one session, without a single change of mind. Details such as a tent rope drawn through wet paint with a dry, narrow brush, and the briskly painted pattern on a girl’s print dress serve to objectify the brushwork’s apparent spontaneity. It was a rare achievement. We would be missing the point if our response to the work stopped at beach subject, colour, form and brushwork. A sun-filled beach subject may be the springboard but is not the source of the intimacy and pleasure the work expresses. The artist almost certainly did not know the women and children grouped on the beach, whose body language he registered with the impersonal and scanning gaze of a beach-goer, while their faces remained a blank. Rather than the subject, his own state of mind seems integral to the painting’s air of ease, confidence and completion. Relaxed, engaged with the scene, he has unwound to the extent of dressing the figures in stylish bathing costumes and girl in a print dress. These touches, which bring the élan of high fashion into the image, are reminiscent of a family story about de Maistre. An aesthete and exacting composer even in childhood he made costumes for dolls styled on the dresses he saw and liked at a Sunday’s church parade. De Maistre’s introduction to St Jean de Luz, the newest and most fashionable of France’s beach resorts – birthplace of Ravel, site of Fauve paintings by Marquet – had probably been the previous winter, as a guest of his cousin Camilla and her husband Lieutenant-General Sir Alfred Keogh, who had retired there in 1922. 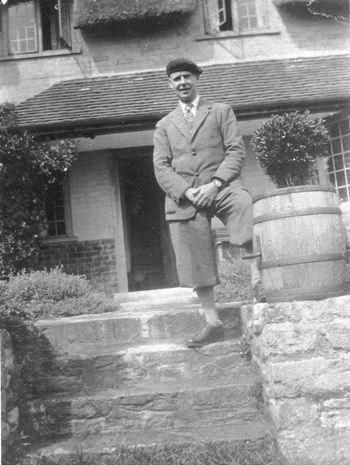 Attracted, he found a studio to rent and returned with a group of students in October or November 1924. The Beach was among the first works produced during the four months he spent there (until 1 April 1925). 2. Roy de Mestre (as his name was then spelt), ‘Modern Art and the Australian Outlook’, Art in Australia, Sydney, December 1925, unpaginated.